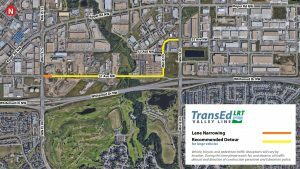 EDMONTON, AB – June 11, 2018 – Starting on or about June 15, 2018, lanes along 51 Avenue east of 75 Street will be temporarily shifted to accommodate track slab installation for the Valley Line LRT. This work is expected to completed by the end of the summer. The number of lanes will not change and access will be maintained during this shift in traffic. 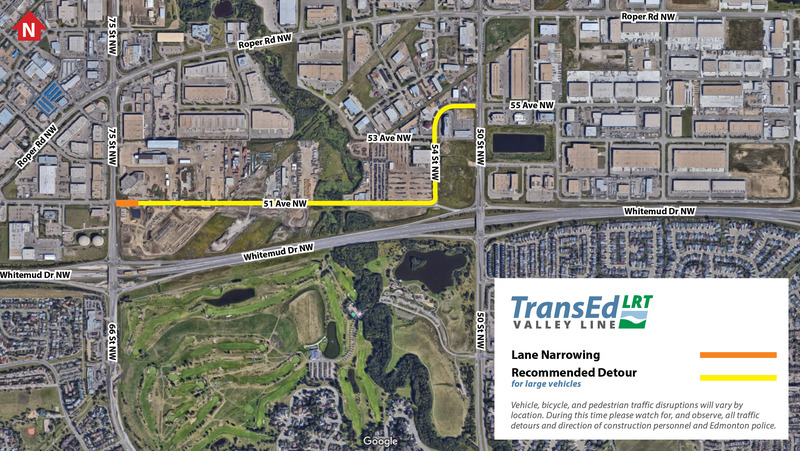 Please note that large vehicles will need to adjust for a narrower turning radius when accessing 51 Avenue from 75 Street northbound and southbound. It is recommended that large vehicles access this area via 50 Street. Lanes along 51 Avenue east of 75 Street will be shifted to accommodate track slab installation. Entry to this area will become narrower during this time, affecting large vehicle access. Please refer to the attached map for more detail. For more information, visit our website http://transedlrt.ca/advisories or contact us via email at info@transedlrt.ca or by phone 780-224-0964.